The Clayton River Walk on the Neuse is a beautiful 4-mile, 10-foot wide paved trail that begins at the Wake/Johnston County line and parallels the Neuse River under Covered Bridge Road. Similarly, the Buffalo Creek Greenway in Smithfield is a three-mile, paved trail also abutting the Neuse River in parts. Both trails are enjoyed by locals and visitors alike as they walk, bike, and jog. But did you know that the two well-worn paths are part of a greater trail? These Johnston County trails are part of the 1,000-mile Mountains-to-Sea Trail, which will connect Clingman&apos;s Dome in North Carolina&apos;s Great Smokey Mountains National Park to Jockey&apos;s Ridge State Park all the way at the coast. The trail is still being completed throughout the state so that eventually the entire trail will exist off of main roadways and on both non-paved and paved trails and greenways. However, there are still parts of the trail currently where hikers or bikers have to share space with road traffic. To get an idea of the enormity of the trail see the map below. The second map is a zoomed-in version showing the greenways, roads, and riverways that make-up the trail through Johnston County. 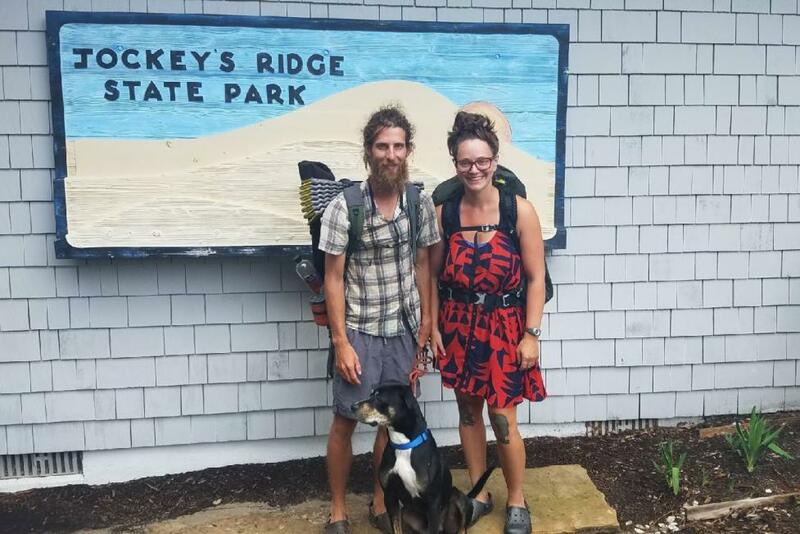 Matt and Annie Lyon completed the Mountains-to-Sea Trail (MST) last year, including the sections through Johnston County, and Matt was kind enough after their excursion to answer some questions about their journey, which you can read below. What was the route and modes of transportation you used on your MTS journey? We chose to go the shorter route through Great Smokey Mountains National Park (GSMNP) because Bowie, our 4-legged companion and bear-deterrent wasn&apos;t allowed in the park. Upon leaving GSMNP, we basically followed the Blue Ridge Parkway over Mt. Pisgah, through Asheville, and climbed the highest point in the east coast, Mt. Mitchell. We then went through the ever-trying Linville Gorge, Harper&apos;s Creek, Moses Cone, Blowing Rock, Boone, to Deep Gap, Doughton Park, and Stone Mountain. This is where the road-walking began. We walked through numerous little towns into the incredibly-friendly town of Elkin (the hometown of the MST). There we paddled the Yadkin River into Pilot Mountain State Park. From Pilot Mountain, we walked on horse trails and back roads to Hanging Rock. Once we got to the top of Hanging Rock, we hopped on bikes (Bowie in his chariot) and rode through the towns of Danbury, Oak Ridge, Greensboro area, Mebane, Haw River, Hillsboro, Eno, Durham, around Falls Lake to Wake Forest, Raleigh, and then to Clayton. In Clayton, we changed transportation again to canoe. We paddled all the way down the Neuse River, through the towns of Smithfield, Goldsboro, Seven Springs, Kinston, into New Bern, and into the mouth of the Pamlico Sound to the Neusiok Trail where we walked the rest of the way to Jockey&apos;s Ridge. We started the trail on April 21, 2017 and completed it on August 3rd. We were contracted to do some work back home so we did have a couple trips back to Johnson City to do some work and change gear (pick up bikes). How did you come through Johnston County specifically and what did you do while you were here? We came into Johnston County by way of the Clayton River Walk Greenway on bike. We were welcomed by Lisa and Larry Bailey. They were so welcoming and kind! During our stay, we were also fortunate enough to sample the offerings at Deep River Brewing! 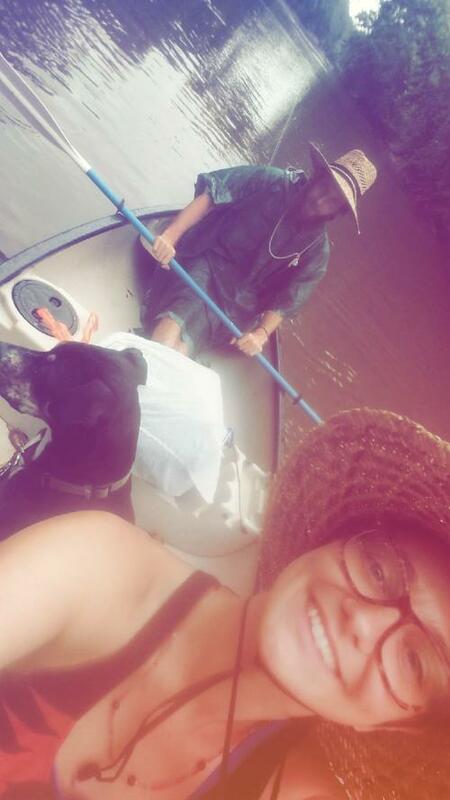 We departed Johnston County by way of canoe. 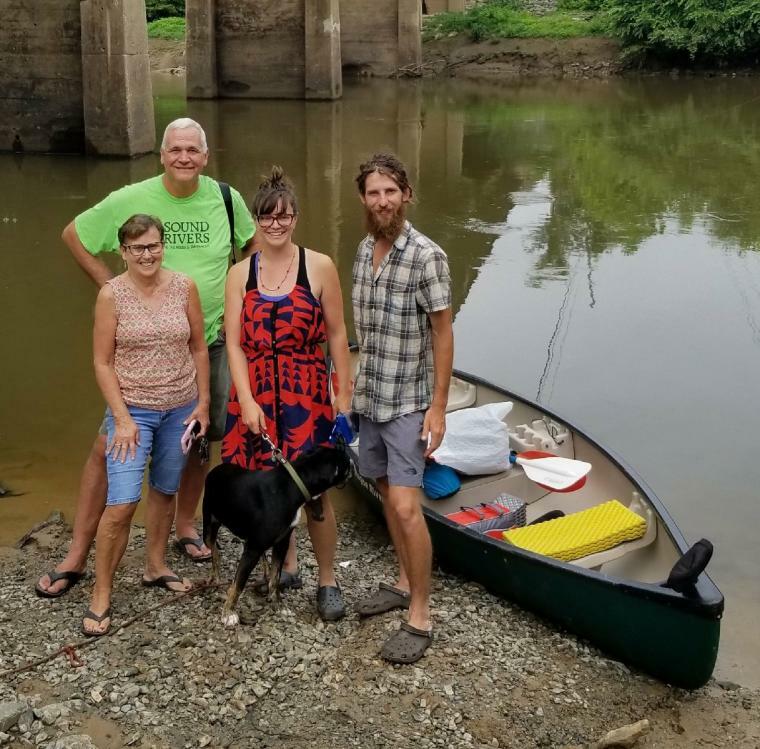 We started paddling the Neuse on July 16th. Did you have support or sponsors along the route? We didn&apos;t have any sponsors, but we were supported by our families and uncounted kind strangers who welcomed us into their vehicles, their homes, let us use their showers and laundry appliances, and/or fed us. We can&apos;t thank those people enough, they made our lives immensely easier. Why did you and Annie want to accomplish this amazing task? Are you adventure enthusiasts or was this a wild hair? I have completed the Appalachian Trail. I have always been a hiker and nature enthusiast. I had wanted to do a long-distance hike at some point, and things just came together to do it and Annie was game too. It was part farfetched dream, part wild hair. What do you feel after completing it? Any next adventure plans/goals? It&apos;s very satisfying having completed the MST. It was quite an adventure and an exciting accomplishment! We have our sights set on the Pacific Coast Trail (PCT) on the west coast and I would like to do the Appalachian Trail again in 2019. 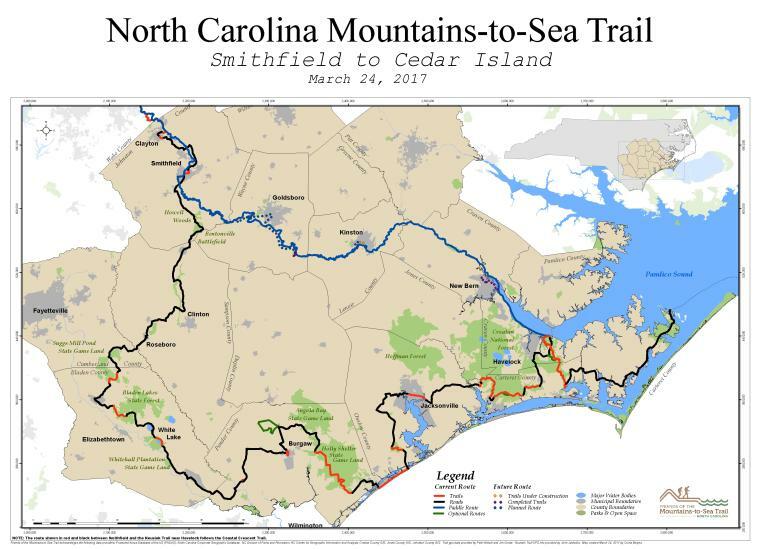 Why do you think it&apos;s so important to complete the MST trail through NC? You learn so much doing a long-distance hiking. The MST threw a lot of hurdles at us and we&apos;ve learned that with a little adaptation, rolling with the punches, and a lot of support, emotional and otherwise, from others, you can overcome more than you think. For more information on the MST you can visit the Friends of the Mountains-to-Sea Trail website, a non-profit dedicated to completing the trail and also curating and sharing information about how to explore the trail (whether you want to experience part of or all of it). In Johnston County you’re welcome to walk the greenways to say that you’ve hiked part of the MST. Or, like Matt and Annie, Johnston County may just be one part of your journey along the entire trail.